Looking for new writers invariably means kissing a lot of toads. Usually I just sigh and give up somewhere between 10 and 20 percent, saying, “It may be somebody else’s cup of tea, but not for me.” Occasionally, though, I come across a book that is so annoying that it really tests my vow not to throw my Kindle at the wall. The book I’m not going to review today was one of those. I’m not going to review it because for all I know, the writer is a perfectly nice person who just didn’t have a beta reader to tell him, “Sorry, this is not ready for publication.” And I don’t like holding people up for public obloquy. But the writing, dear God, I wanted brain bleach long before I’d passed my eyes over even 10 percent of the text. It is so full of things Nobody Should Ever Do to a Reader. It would take too long to describe all the offenses against the English language, so I’m just going to mention the most annoying one: Pushy adjectives. That’s what I call adjectives that the writer throws in to tell you how to feel about something without going to the trouble of actually describing it. Within the first few pages our heroine had melted metal sheets with “incredible temperatures,” had taken an “incredible leap.” A little later something “had done some incredible work on her health.” Someone else’s trigger finger “released a volley of countless slugs.” And there was a “merciless army” at the door. Oh, and somebody was guilty of “hateful preaching.” The expectation of sudden death was “heartbreaking,” and so was somebody’s rage. That is… a very poor substitute for actually amazing me. It usually happens when I'm about 3/4 through with a book. I wake up one morning knowing that this particular book doesn't even deserve to go on a slushpile, it's a farrago of nonsense, it's boring, nobody will ever want to read it. This time it's happening when I have only a chapter and a half to go on INSURGENTS. Possibly because this book is shorter than my usual, the internal demons were goofing off and thinking, "Oh, we don't need to attack until she reaches 75,000 words." Unfortunately, it seems that somebody blew the alarm whistle: "She's not going to get to 75,000 words on this book! Fire when ready!" So here we are again, and the only way forward is through the Insecurity Demons. Arguing with them does no good; I simply have to get my head down and adopt the attitude that I don't care what they say about quality, I'm going to finish this thing. Today I've done 1600 words in that mode. It's not fun. But sometimes it's necessary. The demons usually STFU after it becomes clear that they're not able to stop me writing. But this time I'm so close to the end that they may be able to keep it up for the rest of the book. Full speed ahead. And damn the torpedos. Yes, I know I was going to post this review last week. I had forgotten that I always read Megan Whalen Turner’s books twice through, once to enjoy the story and again to appreciate the tricky structure. Thick as Thieves was no exception. How much can you say about a book that is the perfect vehicle for its story? As always, Megan Whalen Turner’s prose is clear, luminous, limpid. If you think of a novelist’s prose style as a window through which you see the story, hers is a windowpane so clean that you hardly know it is there. Like Mary Renault, she gives voice to an archaic period (she keeps saying on the basis of technology it’s a fifteenth-century world, but it feels much more like classical Greece to me) not by dragging in archaic words and phrases, but by stripping modern English of whatever shows modernity. She’s a master at avoiding contractions, slang, neologisms – anything that might yank the reader back into present time. In all this, Thick as Thieves is like her previous four books in this world. As always, she presents us with engrossing characters, a story that keeps reeling us forward, and – dammit – a surprise at the end. I know Megan Whalen Turner’s tricks by now and yet she still surprised me. To hell with the style, you say: what’s it about? On the surface, it’s an escape-and-pursuit story: the slave Kamet, on learning that his master has been poisoned, and knowing that slaves are routinely tortured in an investigation, flees the city but finds his path to freedom blocked by determined pursuers, “accidents,” and suspicion. On another level, it’s a story of a slave becoming a free man in a much deeper way than simply striking off his chains. And it’s a story of an unlikely friendship growing between two very different men. And as in her previous books, Megan Whalen Turner adds depth and resonance to her story with her invented mythology and literature. Thick as Thieves differs from previous books in drawing from the culture of her Medes rather than from her Greek-ish city-states. The prose story is punctuated by brilliant pastiches of something very like the epic of Gilgamesh, highlighting a friendship between two mythic beings that is very like that between Gilgamesh and Enkidu. She’s pulled it off once again: Thick as Thieves is at once an adventure story, a story of change and growth, and a reflection on the relationship between gods and men. For instance? That blog post title made it through Word's spell checker without raising any red flags. Back when the First Reader was publishing regularly, he used to run his papers through a spell checker because he knew he couldn't spell. Initially he trusted this step to clean everything up. After a certain amount of mostly civil discussion about how using "they're is" for "there is" affected the credibility of his work, he started getting me to skim everything as a second check. I've been reading a lot of indie sf/fantasy lately - books that the authors have released directly to Kindle without going through a traditional publisher - and I am becoming grouchy about the plethora of minor errors that are probably due to an over-reliance on spell checkers. A number of indie authors brush off criticisms of this sort of thing by saying, "Oh, everybody is down on indies for having too many typos when actually we're no worse than trad publishers!" That is: I don't care whether Indie Book X has more typos than Trad Book Y. What I care about is that Indie Book X had enough careless errors sprinkled through it to yank me out of the story on a regular basis. And the type of error was almost always a case of a legitimate word used incorrectly to replace the "right" word. And it's not just discreet/discrete or deserts/desserts, which three-quarters of the English-speaking world predictably gets wrong. It's happening with common words that I can't believe any marginally literate person would mix up. "Her eyes shown with delight." "Never mind the passed, let's talk about the future!" "I have a grate idea." "There's a general disquiet among the populous." "I'm go to practice more next time." I just don't believe that anybody who writes a pretty decent 80,000 word book is really confused about how to spell shone, past, great, populace, or, for heaven's sake, going. Okay, I might give them a pass on populace, but even if they're shaky on the correct spelling they should realize that populous isn't the word they're fumbling for. It isn't even the same part of speech! "Don't worry about grammar, spelling, or typos. That's mere craft; you need to concentrate on inspiration." Or the much-repeated assertion that "If a manuscript is perfect, you probably edited it sixteen times and squeezed all the life out of it." Kicking the reader out of a story trance and into musings about what you probably meant to write is just not a good idea. I don't care if you got "just one little letter" wrong. (There's only one letter's difference between shone and shown) Relying on spell check to fix all your problems is lazy, and it turns nice, calm, easygoing readers like me into crabby ranting maniacs. DON'T DO IT. Yesterday the First Reader got an email saying, in essence, "Are you concerned by the worldwide ransomware attacks? Get the latest fixes from Microsoft! All you need to do is click on this one little link..."
There's a kind of chutzpah in phishing to infect computers with the program you're warning them about. You know, I miss the Nigerian con letters. At least they were entertaining. In the family we call this "R.L.Moore-ing," after the great mathematician and teacher who insisted that it wasn't a lie if everything you actually said was the literal truth. One of my characters uses this in the current book: already self-conscious about being young for his position at 23, when he meets an Older Woman of 28 and she asks his age, he says, "I'm still on the right side of thirty." "Pelle urged Mustafa Kemal to stop the movement of Turkish troops towards the neutral zone of the straits. Mustafa Kemal refused, saying that his government had never recognized the existence of the neutral zone, nor could he hold back his victorious troops. Unless an armistice was signed, they would march rapidly on Istanbul. But when Pelle had left, Mustafa Kemal turned to the Turkish journalist Falih Rifki and said with a smile, 'Our victorious armies... I don't even know where they are. Who knows how long it would take us to reassemble them.'" That may come in handy during negotiations for the end of the war in INSURGENTS. Up-river from the British headquarters, some local warlord is making trouble. A young lieutenant is told to take a boat up river and tell the warlord to cut it out. "And what do I do if he refuses?" "It's not worth starting a war... I suppose you'll just have to turn around and come back." Up the river we go, and in due course the lieutenant conveys the British ultimatum to the warlord. "And what if I refuse?" the warlord asks. "In that case, I should, with regret, be obliged to carry out the second part of my instructions." [Inner Cat: Waah. Do I hafta write a blog post? The new Megan Whalen Turner just came out. Adult: And the rest of life did not conveniently go away. You also have to write the next scene, do something with the shrimp in the fridge, and pick up your books before the cleaners get here. Inner Cat: But I haven't done anything interesting! What, your various identities never argue with each other? How boring. So. Research for a science fiction book: it's not just about science. The three books in the picture are just a part of what I've been reading for INSURGENTS. Starts off with guerrilla war in the mountains. Not exactly my area of expertise; fortunately the First Reader has half a dozen books on World War II in Greece. 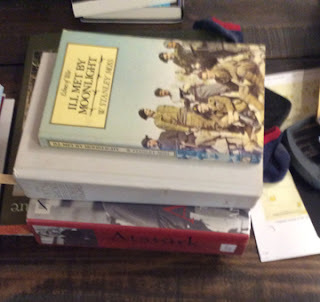 I started out with Ill Met by Moonlight, the story of how Patrick Leigh Fermor kidnapped a German general, and also read several other, less entertaining books. Quit when I decided I couldn't bear to read one word more about the rival resistance groups and how they undercut one another. That wasn't what I was looking for... but somehow it's worked its way into the story. Part of the backstory of INSURGENTS is that on a world with just two continents, the green and inviting one has been settled. As its government grew more and more totalitarian, it began dumping political dissidents onto the other continent. Yes, I was thinking about the beginnings of Australia. And Robert Hughes' The Fatal Shore - that's the second book in the stack, the one whose title you can't read - gave me lots of ideas about how the first deportees might have managed in that bleak environment. None of that made it directly into INSURGENTS, but I needed to know how the society developed before I could describe it. And... there's a lot of stuff currently stored in the back of my head that may recall a book of its own some day, about those early deportees. But not right away! I'm tired of backing up. It's confusing enough to have written AWAKENING first and then to realize I needed a book about events a generation earlier. Now I'm getting to the part where the rebels, having (sort-of) won, have to create a government overnight to replace the colonial rule. Our own history is a grand source for that. But just to keep it interesting, I'm also feeding the subconscious huge dollops of the life of Ataturk (bottom book) who faced a similar problem after the collapse of the Ottoman Empire. And again I'm getting more than I bargained for: in the story of the negotiations there's a beautiful example of lying by omission which I hope to steal for my own book. More about that tomorrow. Gotta go talk to the shrimp now. I'm about two-thirds of the way through Pam Uphoff's Wine of the Gods series and loving every minute. There are 31 books in the series now - I hope there will be more - so even somebody who reads too fast, like me, can enjoy her invented world for quite some time. Worlds. The books are fun to read. That's the most important thing. The characters are mostly likeable, the plot twists and turns keep me guessing, problems are resolved believably. And as a writer, I am insanely jealous of the complex universe she's created with its infinite possibilities. Begin with a collection of genetically engineered children, some of whom can influence computers with their minds, and a corporation that's using them to explore gates to alternate worlds; in this telling, there are infinitely many worlds more or less like our own, but in a tree where splits occur with major astronomical events. Exile all genetically engineered beings to one of these alternate worlds, an unpopulated one, along with the non-engineered families who want to go with their children. Let them blow up the gate on their way out so that they're truly alone. Show them building a new society. Jump forward a millenium or so, and look at the countries that have been formed and how descendants of the genetically engineered do or don't fit into these societies. By now, they've developed a lot of interesting abilities, and they call the collection of skills "magic" (you know, as in "any sufficiently advanced technology is indistinguishable from magic." Thirteen of the original exiles appear to be functionally immortal, but due to brain damage during the exile they don't have very clear memories of how they got here. The collective subconscious has fitted them into archetypes and declared them to be gods. So as well as witches, wizards, and mages, you have the God of War, the God of Peace, the Goddess of Health and Fertility, and so on. And you get some extremely amusing consequences when the God of War and the Goddess of Health get drunk together and decide to create a self-replicating wine containing all the useful spells they can think of. Getting dizzy yet? Here's another wild card: there is a third world with a small population of genetically enhanced people and a religion built around them. And they're interested in Comet Fall, too. By Book Five everybody is spying on everybody else. You see why I envy this? It's every sf/f writer's dream to build a world with so many possibilities that you never run out of stories to tell. Foreshadowing. It's part of your dance with the reader, a kind of flirtation, like showing a bit of ankle to keep them hoping that a lot more will be revealed if they stick around. It's a promise to the reader: something really good is coming up! It's a way to tease the reader: bet you can't guess why soandso is suddenly doing suchandsuch! It's a way of making the implausible events of a story plausible: the protagonist who suddenly escapes a bad situation by climbing a sheer cliff will get a book walled, while the protagonist who used to be a climber until she lost her nerve after a bad fall will be much more believable. Not only are you expecting her to encounter that cliff, you'll be rooting for her to conquer her fears and do what you've already been convinced is within her abilities. Of course, that last example works best if you can bring in her climbing history without slapping a big fat THIS IS GONNA BE IMPORTANT label on it. Maybe you show it in bits. She's excessively uncomfortable, to the point where it seems out of character, about visiting the rotating restaurant on top of a skyscraper. A "surprise" date where somebody takes her to a rock climbing gym does not go well. It doesn't take much; the object is to drop hints subtle enough that they won't appear as big red flags to the reader, but will give them an "Aha!" moment when the only way she can rescue herself and her friends is by going up that cliff. Foreshadowing ploys change over time, and it's a good idea to be sufficiently familiar with current work in your genre to recognize what's being done - and overdone. In the seventies you could identify a Gothic romance by (1) the cover (blue tones, dark tower, girl in a negligee fleeing the dark tower) and (2) the near-certainty that at some point the heroine would say, "Had I but known...." Writers of Gothics may have destroyed HIBK as a foreshadowing device for all time. What's inspired me to think about the virtues of subtlety and restraint in foreshadowing? I recently read a thriller by a writer who is infinitely more successful than I am, so how dare I criticize anything he's written? Well... this book starts with a tiger heist, the details of which are a lot of fun to read. Scenes with the bad guys throughout the book establish that they quickly kill one of their two tigers for body parts but keep the other one alive, presumably so its parts will still be "fresh" when they get around to it. So... by the time this tiger has been kept alive and in captivity for 80% of the book, you KNOW it's going to eat somebody. And by the time it does get loose and chow down on a villain, you're not shocked. You're not surprised. You're more like, "So what took you so long?" And I consider that a waste of a perfectly good tiger. Who, me? Uh-uh. Not my talent. Baen once invited me to write my own back cover blurb. The result was so awful that I understand there was an in-house memo saying, "Never let this woman near anything to do with publicity or marketing." But the thing about doing that for which you have no natural talent is, you have to learn. So I've been scarfing down posts from Madgeniusclub with helpful suggestions for blurb writing. This is probably the single most useful article I've read. Dorothy Grant shares the process by which she and her husband work from a long blurb with too much information down to a short, punchy blurb with a good hook. Sarah Hoyt shares a collection of blurbs for the Cinderella story, aimed at different genres. Rowena Daniells discusses the agony of trying to fit a 100,000 word book into the Procrustean back-cover bed of 150 words or less. Think getting down to 150 words is hard? Dorothy Grant challenges you to get it down to 50 words. And if you say "That's impossible," well, she has lots of examples. I'm not at Dorothy's level of expertise yet, but at least I've got the blurbs for both books well under 150 words. For generations Harmony’s totalitarian government has used the bleak continent of Esilia as a dumping ground for political dissidents. Now they’re surprised that the dissidents want to secede. Gavrel is totally devoted to his colony’s battle for freedom. Isvel, daughter of the enemy’s invading general, knows exactly why Harmony should rule. When she is taken hostage by his guerrilla group, he has to draw a line between his personal inclinations and his duty to the insurgency, while Isvel has to remember her duty to escape. There can be no future for two people on opposing sides of this war – so Gavrel will just have to win the war. Orphaned and taunted as an Unlicensed child, Devra grew up determined to expiate her parents’ crime by being the perfect citizen – which means never, ever questioning or defying the rules of Harmony’s totalitarian government. But when one of her students is threatened with “medical rehabilitation,” she finds that her personal values are incompatible with good citizenship. One instinctive act of defiance sends her on a downward spiral towards homelessness and unemployment. But at the very bottom, sometimes you meet someone who shows you a new way up…. What do you think? They're terrible blurbs, aren't they? I know they're terrible. But you should have seen the first drafts! At least for me, it is. INSURGENTS has started coming into my head in significantly larger chunks - 2,000 to 3,000 words a day. It's exhilarating to feel the story taking off like this, and I'm grateful for it - much better than being stuck and unable to see the way forward - but these intense writing sessions do leave me feeling like the village idiot for the rest of the day. I may not have anything much to say until this pace slows down or I finish the book. Writing fiction has this in common with raising children: I'm nowhere near in control to the extent I expected.